Click here to visit the Hill’s facebook and like them. Then on the “Hill’s Giveaway” tab, fill out the form to enter their sweepstakes. 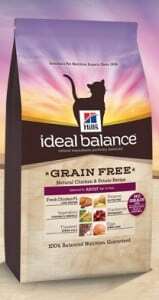 200 winners will score a free 2 lb bag of Hill’s Ideal Balance Grain Free Natural Chicken & Potato Recipe Adult cat food. You’ll have until May 31st to enter this one. Good luck!